It’s been a while since I’ve posted an update to let everyone know what’s happening in the Fishbone Literary Universe. I’m sorry for the radio silence. I’ll try to do better going forward. Today, June 30th, is World Asteroid Day. Out of an estimated million-plus asteroids capable of impacting the Earth, we have discovered only about one percent so far. The 100X Declaration calls for increasing the asteroid discovery rate by about a hundredfold within the next 10 years, so we can get a better idea of what’s out there before it’s too late. Learn more about this initiative at the Asteroid Day website, and consider rereading The Challengers this month to help think about how the world would react to news of an impending impact. The Galaxy Game of the month will be based around the MLB All Star Game on July 11th. Look for your downloadable game board, coming soon on this website! And more Galaxy Games news to share! Book #3, The Mad Messenger, will be released from Spellbound River Press in Spring 2018. The book is in the copyediting process now and will be the most action-packed and alien-packed installment of the series so far. Watch this blog or my social media feeds for more information as the release date approaches, and sign up for the free Spellbound River Press newsletter for more information on my books and other great middle grade reads. Will the Galaxy Games go on after Book #3? Eventually, yes, but for now I’ll be taking a break from sporty sci-fi to work on an exciting new project from Greek mythology. With this new series, I’ll be attempting to breathe new life into a character that was created thousands of years ago but was never given a story saga of her own. I figure she’s been waiting long enough. In July, I’ll be trying something new: theme months! The first will be on generating ideas, which I’ll be talking and posting about all month. If you have any suggestions to share on how you come up with story ideas, or any questions for me, let me know in the comments or ping me on Twitter or Facebook. Your feedback is always appreciated. Let me know what you think about any of my books, which are available in print and ebook format through all the usual sources. I’m not sure how these things get started, but multiple news sources are tracking rumors of a Batman/Galaxy Games crossover, to be announced at the upcoming Video Game Awards. The project is said to be called New Batman and the Guardians of the Galaxy Games. Headline from This Gen Gaming. I’ve been gobsmacked by these rumors in my feed, and feel a need to head them off before they, much like the Andromeda Galaxy, spiral too far out of control. Yes, I am known to be a longtime fan of the Caped Crusader and yes, I will be putting a Batman reference or two into The Mad Messenger, the upcoming third book in the Galaxy Games series, but the fact remains that the only GG characters with masks and capes currently planned are El Gatito and his fellow luchadores. I’ve not been in touch with gaming journalists, with anyone at DC Comics, or with any game developers working on a Batman project under license from DC. And if anyone’s been talking with these people on my behalf, it’s not being done with my knowledge or consent. I would read that story, but I’m not looking to introduce superheroes into the official Galaxy Games canon at this time, nor is there yet an in-story organization called The Guardians of the Galaxy Games. Please spread the word, and help squash these rumors for good. So happy to be attending the annual Local Author Fair at the Groton Public Library on a foggy Small Business Saturday. Because books make the best gifts. 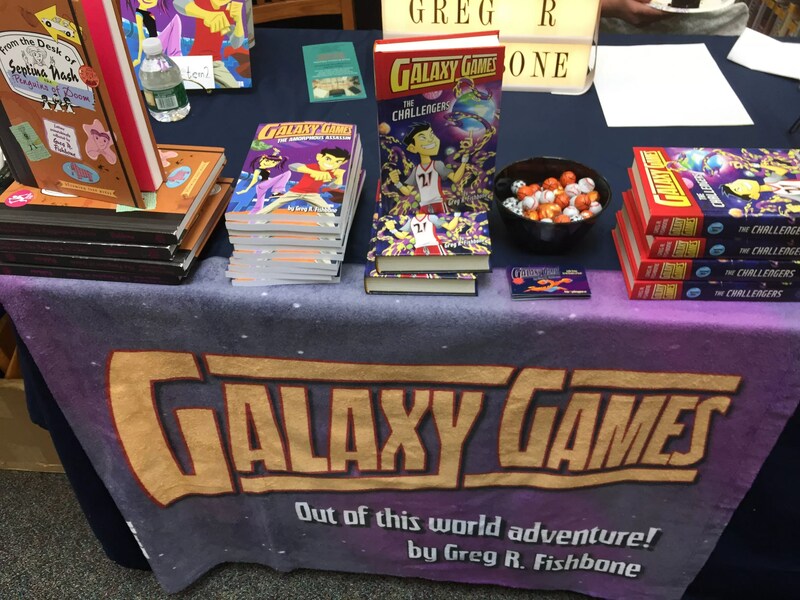 GROTON — A switch in publishers has not slowed local children’s author Greg Fishbone as he takes his successful “Galaxy Games” books for middle-grade readers — from outer space to inner space — with upcoming volumes set to explore characters’ lives. Fishbone, an attorney who also operates his own web design business, recently moved his series from Tu Books to Spellbound River Press, which is set to pick up the Galaxy Games books from volume 2. “Tu Books is publishing some of the best multicultural genre books for children and teens,” said Fishbone of his former publisher. “Their entire list is worth checking out, and I’d have kept Galaxy Games with them forever if I could have but things happen in the publishing world that are often beyond an author’s control. It was an amicable break. “Galaxy Games is my sports and science-fiction novel series for kids about the biggest sporting event in the universe, to which Earth has been invited to compete for the first time ever,” explained Fishbone, a resident of Main Street. “The games are like the Olympics, World Cup and Super Bowl all rolled up and launched into space. And it’s all kids against kids because with most alien species, as with humans, children are better and faster than adults at picking up new rules and adjusting to new environments. Interested in science fiction from an early age, Fishbone spent years honing his talent. “I started as a reader,” recalled Fishbone. “I used to make a game of guessing where the story would go next. Sometimes I was right, but when I was wrong, I often liked my version of the story better than the one in the book. So I wrote them down. “Someone told me that you had to write a million words of crap before you got it all out of your system and got to the good stuff,” noted Fishbone. “Science fiction has always been a mirror on the society it’s written for, and our society has become more and more diverse,” said Fishbone. “Many books being published today could not have been published in the ’80s, and many books that did well back then would not be published today. “The books I liked most were the exceptions to that rule: like Madeleine L’Engle’s ‘A Wrinkle in Time,’ which featured a girl protagonist; Octavia Butler’s ‘Wild Seed,’ that took place in Africa; or Ursula K. LeGuin’s ‘The Left Hand of Darkness,’ that took place on a world with only one gender. For me, these were opportunities to explore and speculate, which is what science fiction should be all about. Fishbone fell into writing for children by accident. The results have met with a positive response. Interested readers can check out the Galaxy Games series from online sources such as Amazon and Barnes & Noble in both hardcopy and ebook formats. Book #1 is now available with #2 due out this fall. Note: Galaxy Games Book #2: The Amorphous Assassin is now available from Spellbound River Press! I was thrilled to have pre-release copies of The Amorphous Assassin in time for the Third Annual Central Massachusetts Children’s Book Festival, where local families came together with authors and illustrators to celebrate great books for children. I also had copies of The Challengers and my out of print epistolary book, The Penguins of Doom. Many old friends were in attendance and a fun time was had by all. Speaking of which, if you like the Galaxy Games series, and middle grade sports books in general, my friend David Kelly has a baseball mystery series that visits Major League stadiums across the US and Canada, a new sport-specific series, and a fascinating non-fiction baseball book about some very special mud. David Kelly and I check out each other’s latest books. I received an entire box of The Amorphous Assassin, just in time for a book signing at Groton, Massachusetts’s Bliss Bakery as part of a Local Business Night Out sponsored by the Deluxe Corporation. It was the first time this title went on sale, and easily the best-smelling book signing I’ve ever done, thanks to all the fresh-out-of-the-oven cookies and cakes all around me. Thanks to everyone who bought a book. Enjoy it with a nice blueberry scone! Proudly powered by WordPress Theme: Sensible WP.